Piercing parts of your body have become increasingly popular, and the options are limitless—virtually every part of the skin can and has been pierced. One of the more popular options is the belly button, or navel, piercing. When done right, belly button piercings look good. However, they also need special attention to prevent infection and other complications. If you decide to pierce your belly button, be cautious when asking friends and acquaintances how to do it. They may or may not have the right answers, so take their “advice” with a grain of salt. Better sources for learning how to safely pierce your navel are books and reputable Internet sites. Take advantage of the library and listen to advice that is repeated by different sources. Each belly piercing experience is different. It can lead to no problems whatsoever or serious complications. So don’t be nonchalant about it—do some research before getting the procedure done. Before you get a piercing, make sure you have realistic expectations about the process. Expect it to take around six to nine months for your piercing to fully heal. Until it has fully healed, you should not go into swimming pools or hot tubs, use sunscreen on the pierced area, or wear tight clothing that may catch. So if you want to show off your piercing all summer at the beach and by the pool, you will have to get the piercing far in advance—i.e., the previous fall or winter. If you have decided to go ahead and get the piercing, the next step is to choose a salon. Because an infected piercing carries health and cosmetic risks, it is imperative to choose one that is known for its safety and sanitary procedures. The first step to do so is to look up salons that are registered with the Association of Professional Piercers (APP). While not all professional piercers are part of the APP, every member salon is required to meet or exceed a standard of safety. The APP also strictly polices salons falsely claiming membership, so if you see the certificate, by-and-large, you can rest assured that you will receive a quality piercing. The piercer should be wearing gloves. All equipment should be either brand new or sterilized. Either way, make sure the piercer wears gloves and watch him or her open the sealed package (sterilized equipment is placed in packages as well) immediately before it is needed. There are three pieces of equipment in particular that must be sterilized: the needle itself, the gunpoint, and the jewelry. The piercer should clean the belly button area with germicidal soap before piercing. If you have to prompt anyone on the staff to do these things, do not get a piercing! Take your money and go somewhere else. Do sanitize your hands regularly after getting your navel pierced. Use ice packs for the pain you may feel after getting your piercing. The cold will not only numb the pain; it will also stop the blood from causing swelling in the area. Carry a bottle of hand sanitizer to regularly clean your hands. It is normal to touch a new piercing involuntarily, and many surfaces you touch may be covered in bacteria that could lead to infection, so this precaution if essential. Clean the piercing with non-iodized salt water twice a day until it has healed. Watch for swelling, soreness, and wetness in the pierced area accompanied by fever. If this happens, you should call a doctor as soon as possible. 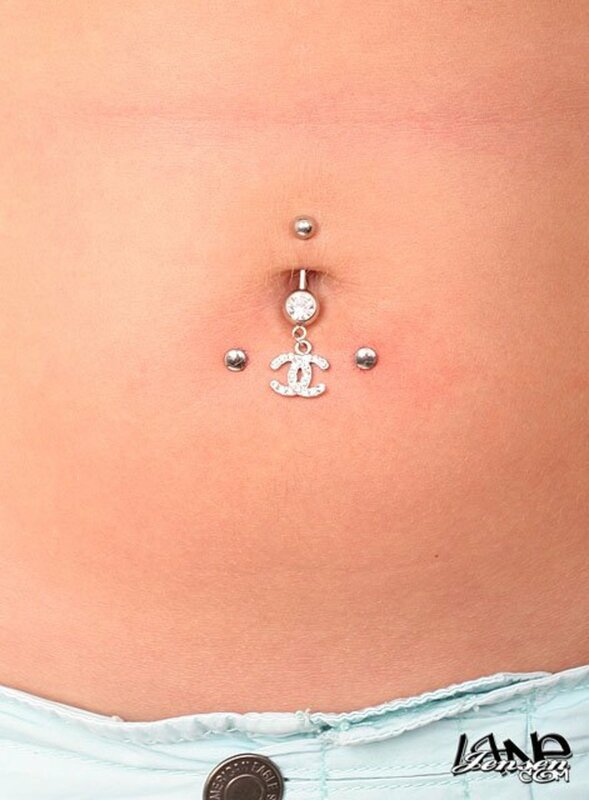 After a new navel piercing, do not wear tight clothing such as waist belts. Use towels to dry the piercing—towels are often a breeding ground for bacteria. Wear clothing that presses against the piercing, such as waist belts or pantyhose. Use hydrogen peroxide or antibacterial ointments such as Neosporin. These will slow healing. Swim in public pools or use hot tubs. Take the piercing out before fully healed. When you hear the worst-case scenario, it’s easy to feel frightened. However, infections are not the usual outcome—it’s just that it would be irresponsible not to understand the risks and work to avoid them with the safety measures outlined above. These simple and easy precautions will ensure that your piercing is an experience you enjoy. Previous ArticleThe rise of the fashion piercing: From septum rings to multiple brow hoops, how much is too much?